In my last post about black shower doors, I added a paragraph about flow later in the day, so if you’re considering this product and you missed it, go read the post again. Also, I have received many requests to post my opinion on painting doors black. Okay so I’m trying to remember if I’ve ever–in 10 years of writing this blog–said these words: “It’s only paint, if it doesn’t work you can paint it again!”. I don’t throw that comment around lightly because actually, painting your house is expensive. Painting one room over a few times–maybe you or your spouse is doing it–okay that’s cheap enough, but truly, hiring painters to paint your vaulted hallways or living rooms, painting the trim, kitchen cabinets, not so much. But a door? That seems easy enough right? 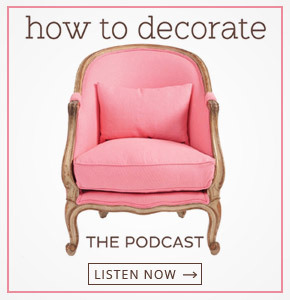 I mean of course you can mess up anything, but certainly painting a door would seem like less of a commitment. Hey, it just occurred to me that an even easier way to see if this would work would be to go out and buy 3 yards of cheap, black fabric and hang it on your door. This way you can see in advance if you’ll like it. Okay so lets start this tutorial by examining why the black door in this first image (above) works. 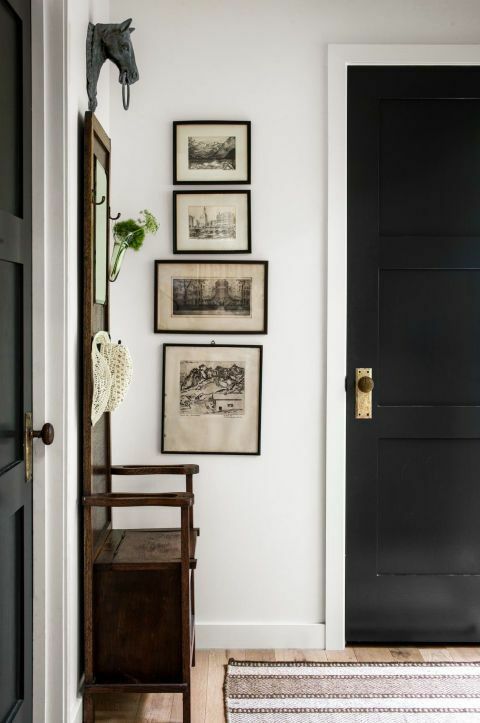 Because the black is repeated in the frames and the area rug and the pale floors provide a nice hit of contrast. This entry (below) has just the right amount of black as well. And black always look great with orange or red brick. 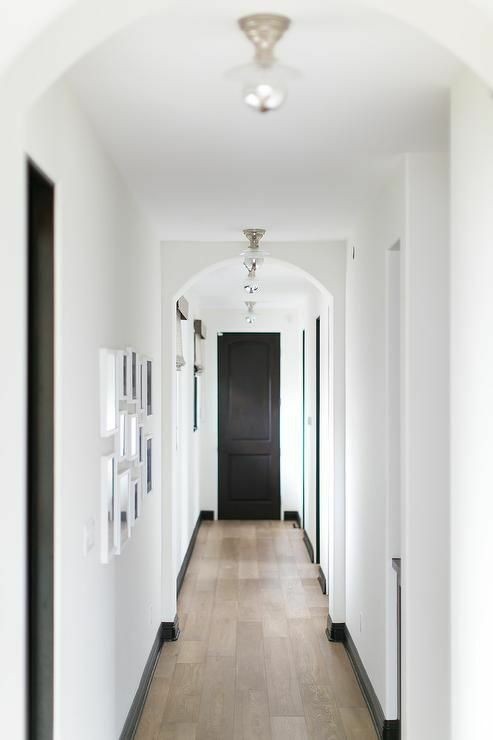 This hallway (above) with light, classic and timeless (with barely any grey) hardwood floors is chic and elegant. 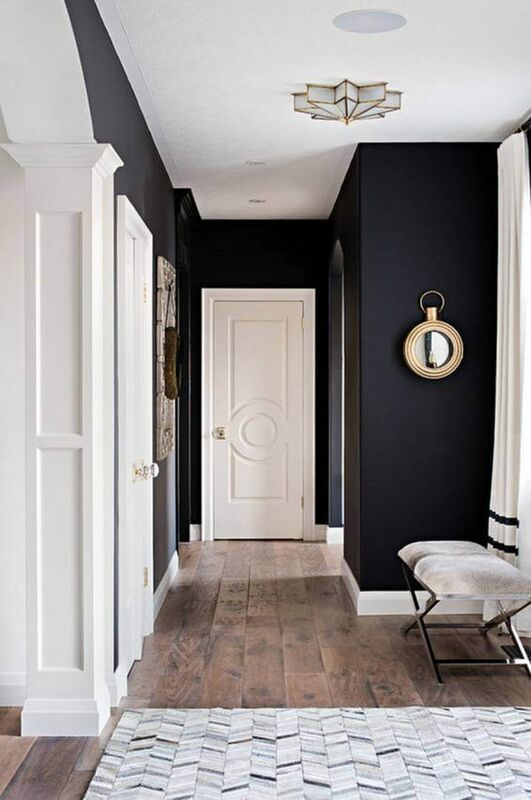 Black doors with dark floors, or this much black trim (above), or certainly not with black walls too, will immediately take your black quota over the tipping point. If you’re not sure about what I’m talking about, take a look at both these hallways below. One has just the right amount of black in it (right), the other feels dark and heavy (left). This is just my opinion, but I learned my lesson about adding too much black years ago here. 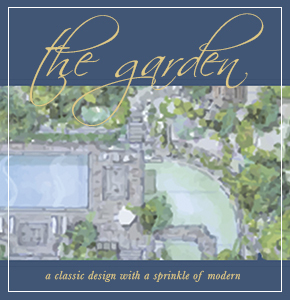 Does your entry look like this one (below)? 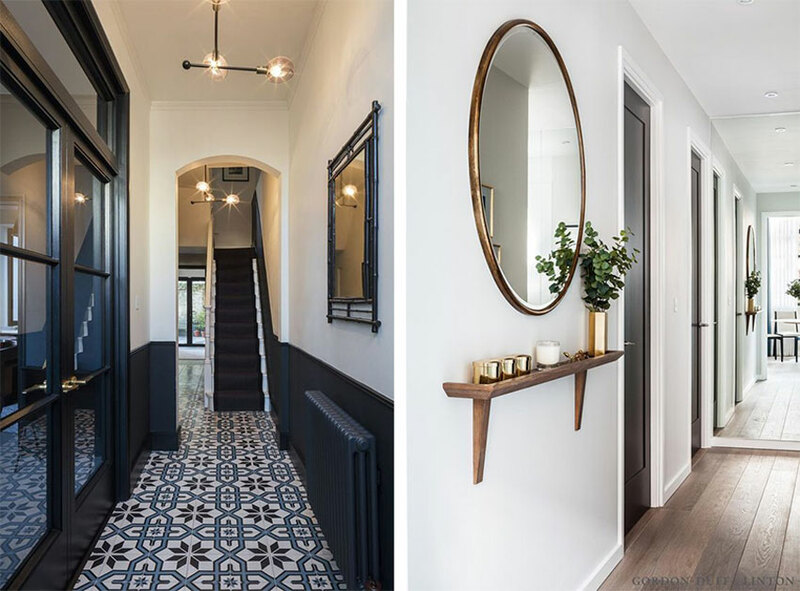 With the fabulous crisp white chairs flanking the door and the white tile floor inset with black accent tiles? If so, then yes paint the walls black too. And notice the walls are also lacquered so the light bounces around, that’s an important step too. 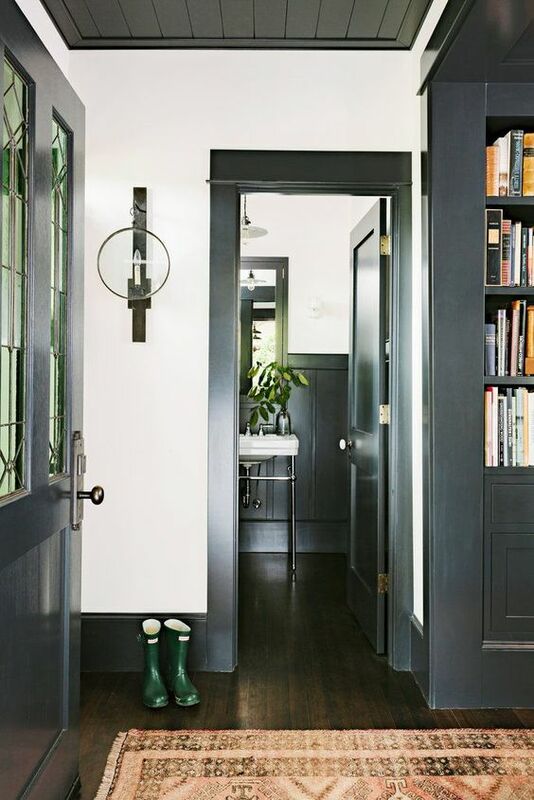 Here’s another hallway with black walls, but notice everything that makes this work. The pretty doors, architecture, styling, white drapes with black banding. These are all the ways in which black looks right instead of harsh. 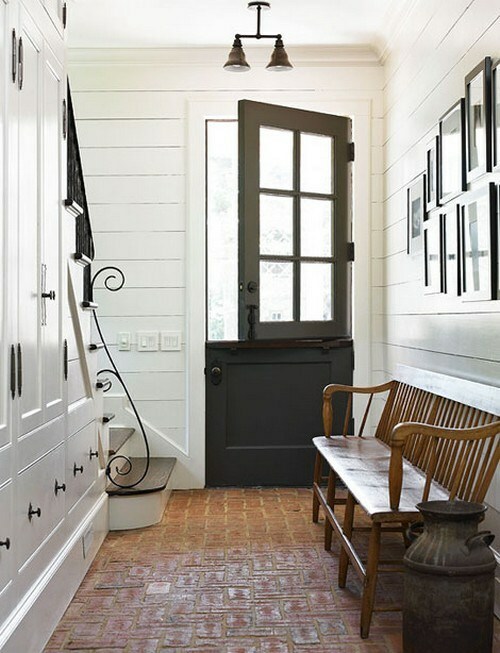 Or if you have french doors along with your dark floors and lots of white around them both (below). The look is immediately lighter and just fabulous again. But notice the last three images are not usually in the average house on the street. Crisp colours like black work best with white, off-white and greys including brighter, or more dramatic colours (below). If you have hallways with pink beige carpet, your doors need to be brown, not black. Earthy colours work best with browns and creams. And don’t get stuck on black doors. This image (below) has hardwood floors, but it would be just as pretty if your carpet was pink beige (which a lot of people have). First, fresh blues are the ONLY clean colours that work with pink beige carpet. And the blue green walls relate to the teal doors. Let me know if I’ve answered all your questions about when to introduce a black door into your house. If you need help with your paint colours, check out our eDesign packages here. Are Black Shower Doors the Best Choice For Your New Bathroom? I’m behind on your posts dear Maria but I’m SO glad you introduced a blue door photo! 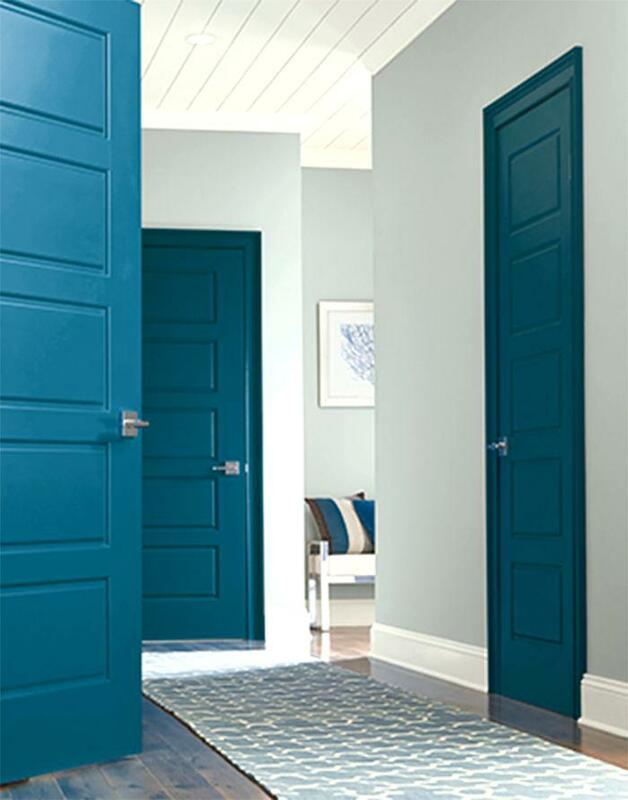 I’ve been contemplating painting just my back door (which is mostly glass) the same blue as my powder room. (Van Deusen) A good way to introduce more flow? Plus, as you say…it’s only paint on a door! Love all you do!